Heya, βrian! Nope, we're referring to our resident rhinoceros. I always prefer to be double brested. Hiya, Kay! Yes, I agree: breasts are better in pairs. Hola, Tony C and gang! Hey, hey, hey, steveo and HollyT!! In since the get-go but on the treadmill. Howdy, Tony and all! Hey, James! Work those pounds off! oh, doris is singing about FLOWERS, not types of Flour. Understood. Hi Tony, hi everyone. Out of the corner of my eye, I thought that might be her in the red jacket. Hi Tony, listeners, warming stones! OH MY GOD Robotto Keiji!!!!!!!!!!!!!!!! Hiya, hiya, Mayuko and Stanley! 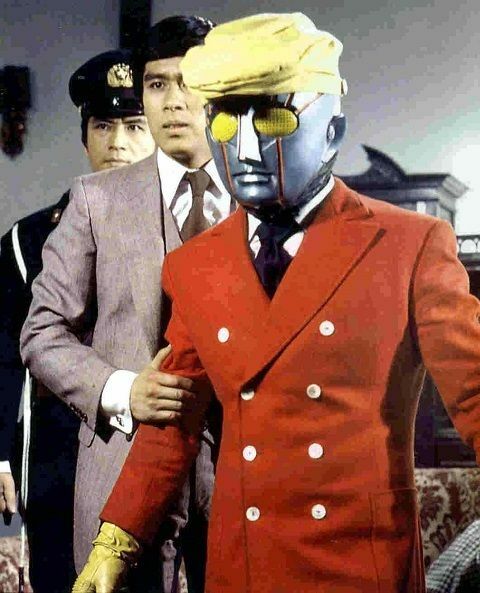 Please excuse my Japanese accent, I meant "Robot Detective". Matching the hat to the gloves shows a sophisticated, stylish android is in the house. L'Empreinte has made an impression on me. @ chresti: You read correctly! 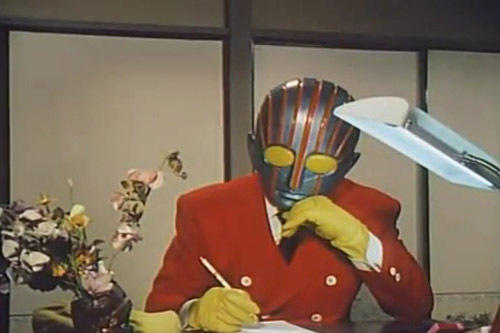 Think he's supposed to solve crime committed by robots/non-humans or something like that. @ βrian: Guess you're very empreinte-sible. S.T.P.O. must be checked out! @james yeah, he really is fashionable! @chresti I love that this futuristic robot person lives in a room with old-fashioned Japanese paper doors. Tell that to the frogs. Stella seems an odd name for a mermaid, somehow. Tony, how did you reach the New bin from over there? nice! this album is climbing rapidly up the WFMU charts! was it a French source? maybe the 5 is silent in French. Why be wet when you can be moist? Hey, Tony! Usually listening in the archives of late, but listening live I can actually smell the Human Flesh. Hey, hey, Nardo and Fred! Sorry Nardo, I didn't shower today. Now I have to run to Manhattan so can't stay until the end sadly! But thank you for the great tunes, as always! Have a great day alll. God I love the Poppy Family. I listen to this record monthly. See you, Mayuko! May Robotto Keiji protect you always! You know why it was 'Poppy Family featuring Susan Jacks'? In other words why Susan Jacks was featured? @ Nick S: Do tell! Because she was so damn fine she HAD to be set apart from everything! HHMMMMM!! DAMN! I like Poppy from Canada, too. Feel like I'm in an old movie house with this Rex track! Don't let the demons grab your ankles! i can see the spirits! Death SS covered this band! I'll be damned. I am. Pun. kitten with a whip ! Do you know Death SS, Tony? Paul Chain? Good Italian stuff. Very much like this but more metal. Italians do Satan well. Turns out Satan is just inverted Catholicism. Amirite? FG Experimental Lab, new to me and digdug! enjoyed the tunes today - thanks Tony! cheers everyone. Dug today's smorgasboard, Tony; thanks! Great show as usual Tony! Really great. Thanks for showing up, everybody! Hope to see you next week!